Yesterday my dad told me about the show that EVERYONE IS RAVING ABOUT because he said the main character reminded him of me. So then I asked my sister, who's almost always in the know about everything, if she had heard about "Orange is the New Black" and she gave me a look of sheer disbelief and minor disgust (it's important to note here, that she was wearing an orange dress at the time). You see, she thought I was updating her on this old popular phrase, as if I had never heard it before, like some kind of out-of-touch grandmother. Bahaha! Who does she think I am ?! I don't know if the hilarity (in my opinion) is coming off in this explanation or if it was one of those had to be there moments, but I think it's that kind of scenario right there that the producers were hoping would happen from naming the show what it is. Am I too naive? (She hadn't heard of the show, B. T. Dubs, which is why I thought I should let all of you kind readers, if there are any, know about it too). Anyhoo, since that moment yesterday evening, I have watched 10 of the 50 min long episodes. I was up until 3 am! (So irresponsible!) But I just want to state that I am super flattered that my dad saw similarities between the main character, "Chapman," and myself... Should I be?? 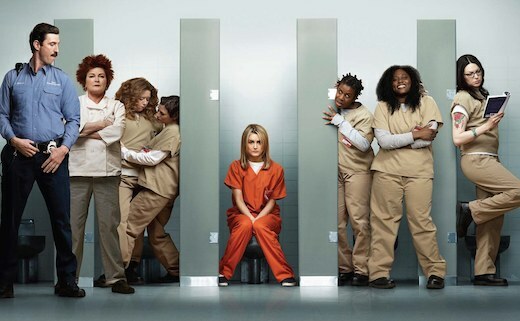 The show is a "Netflix original" comedy-drama series and was created by Jenji Khan, who did Weeds. It's a great cast with some of our faves from the 90's: our good old American Pie friend, Jason Biggs, has a large role and he does a great job. And "Donna" from That 70's Show has an equally substantial amount of face time. The main character, who is fairly new on the scene, has a familiar face that I think I may have cracked the code on: I think she kind of looks like Ben Stiller's fiance in Meet the Parents or the girl that Kevin James (love him!) tries to hook in Hitch or maybe a mix. You'll have to watch it for yourself and let me know if you agree. To whet your palatte with a little teaser: The show is about this girl that goes to prison for a one time bad decision and JUST IN CASE you didn't guess, the orange they are referring to is her prison jumpsuit. I'm no show spoiler, so that's all you'll hear of it from me, but (I bet you saw where this post was going), orange IS making quite a comeback this season and here are some of my favorite orange inspirations for proof. Eeek! I love these chairs so much that mere words cannot express it. Obviously this needs to be included. Although it's timeless, I'll have you know. Hard to tell if I'm more jealous of her legs or the boxes? Maybe we'll just agree I'm equally envious of both. The above is a photo from my all time favorite fashion blog, Atlantic-Pacific. Check it. And the below is actually the dress my sister was wearing when we had our "conversation." Honestly, in this picture the dress looks kinda hillbilly-wack, but in person it's a very cute, flattering dress (it's cut out in the back in a cool way). It's from Nasty Gal and you can get on the waitlist for it here, as it appears that it's currently sold out. But seriously ya'll, watch the show. It's HBO-graphic and the whole first season is on Netflix, which is either awesome or dangerous, jury's still out (just a little legal jargon joke for ya, to wrap this post up nicely).